The galaxy is in turmoil and ripe for the taking, but only those who display greatness shall prevail. Experience ultimate power and attain absolute control with the technologically revolutionary Star Wars™: The Old Republic Gaming Keyboard by Razer™. Ten dynamic adaptive tactile keys allow you to customize all your skills, macros, and hotkeys for faster key-bind accessibility. And the multi-touch full-color LCD track-panel below can be set to either respond to direct gesture input or display interactive information for an exciting new way to experience the game. Whether engaged in deadly space combat in your starship or executing a critical mission on Coruscant, the rapid-actuating slim keys allow for shorter travel distance so you can reach key-binds and macros more efficiently. UNLOCK THE UNIQUE COLOR CRYSTAL! This rare Color Crystal changes the color of your Lightsaber blade and blaster bolts. Stride into combat in style with this unique green Color Crystal! A true Jedi or Sith Master thinks quickly on their feet, adjusting Force™ abilities and Lightsaber stance to suit each fight. With the dynamically changing adaptive tactile keys on the Star Wars™: The Old Republic™ Gaming Keyboard by Razer, put more skills and macros within quick reach, so you're always equipped to emerge victorious from every battle. A new interactive way to experience the world of Star Wars™: The Old Republic™ with media player, interchangeable digital faction symbols and much more, vibrantly displayed on the full color LCD track-panel. Or toggle to multi-touch gesture mode so you can navigate the game world more efficiently. 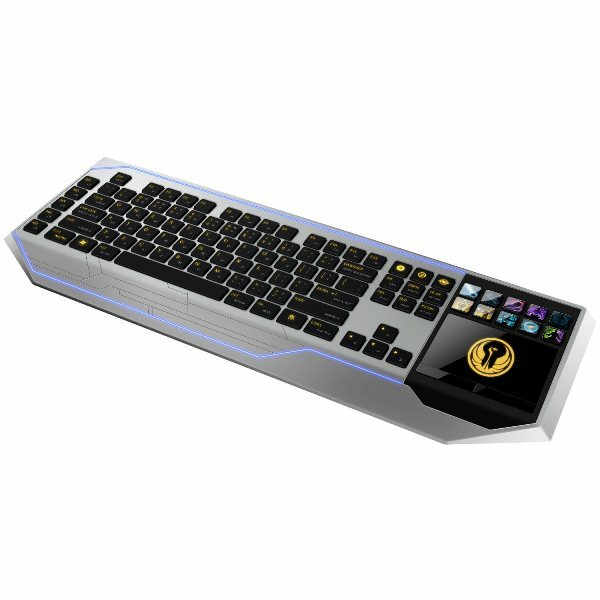 The Star Wars™: The Old Republic™ Gaming Keyboard by Razer™ complete anti-ghosting of up to 10 key presses to let you further expand your repertoire of boss-killing, Flashpoint-destroying, and world-exploring macros and skills. With the ability to execute more than a single key command at one time, it's an absolute competitive advantage for taking your game to the next level. Add and manage multiple devices with Razer Synapse 2.0. Instantly store and access your macros, key bindings, configurations and more from the cloud.